This new edition of the successful calendars book expands the treatment of the previous edition to new calendar variants. It frames the calendars of the world in a completely algorithmic form. The authors describe fourteen calendars and how they relate to one another: the present civil calendar (Gregorian), the recent ISO commercial calendar, the old civil calendar (Julian), the Coptic and (virtually identical) Ethiopic calendars, the Islamic (Moslem) calendar; the Baha'i, the Hebrew (Jewish) calendar, the Mayan calendars, the French Revolutionary calendar, the Chinese calendar, and both the old (mean) and new (true) Hindu (Indian) calendars. Easy conversion among these calendars is a by-product of the approach, as is the determination of secular and religious holidays. 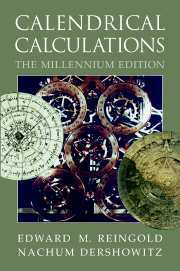 Calendrical Calculations makes accurate calendrical algorithms readily available for computer use with LISP and Java code for all the algorithms included on CD, and updates available on the Web. 1. Introduction; Part I. Arithmetical Calendars: 2. The Gregorian calendar; 3. The ISO calendar; 4. The Julian calendar; 5. The Coptic and Ethiopic calendars; 6. The Islamic calendar; 7. The Persian calendar; 8. The Balinese calendar; 9. The Baha'i calendar; 10. The Hebrew calendar; 11. The Mayan calendar; 12. The Old Hindu calendars; Part II. Astronomical Calendars: 13. Time and astronomy; 14. The French Revolutionary calendar; 15. The Chinese calendar; 16. The Modern Hindu calendars; 17. Coda; Appendices.